It’s not yet a widely known fact that inside every NHL locker room you’ll likely find a ping-pong table – and probably a handful of players gearing up for a game with a few rallies. For the fourth year in a row, New York Rangers forward, Dominic Moore – alongside the NHLPA – has leveraged the players’ pastime to create the event of the summer– a charity ping-pong tournament that brings NHL players, fans, and a few surprise guests together in downtown Toronto, ON to put their skills on the line for a great cause. This year, host Dominic Moore brought along thirty of his current and former NHL player friends to attend the event along with over 700 fans at Steam Whistle Brewery: Matt Beleskey, Sam Bennett, Alex Burrows, Brett Connolly, Logan Couture, Michael Del Zotto, Patrick Eaves, Emerson Etem, Barclay Goodrow, Peter Holland, Michael Hutchinson, Kevin Klein, Nick Kypreos, Michael Latta, Eric Lindros, Jamie McLennan, John Mitchell, Sean Monahan, Ryan Murphy, Antoine Roussel, Mathieu Schneider, Tyler Seguin, Jeff Skinner, Jason Spezza, Cam Talbot, Stephane Veilleux, Steve Webb, Kevin Weekes, Tom Wilson, and Rob Zamuner. For the past three years, Smashfest has benefited research into concussions and rare cancers. This year, as the event continues to grow while raising significant funds for these important causes, Smashfest highlighted its support for a collaborative project on cancer research between the Princess Margaret Cancer Centre in Toronto and the University of California, San Francisco (UCSF). “Any event that can raise awareness of rare cancers is very important to us. Patients with rare cancers don’t get the opportunity to have their treatments studied very readily because they’re not popular and the pharmaceutical companies aren’t that interested in it. Rare cancers really require centers around the world to put their efforts together to collaborate and to do that it takes resources that these events help us create and maintain,” explains Alan Venook, M.D. and Professor of Medicine at UCSF. Smashfest’s significant donation this year will help link Princess Margaret with the UCSF to combine their efforts examining rare cancers and analyzing their respective findings of these complex and under-studied diseases. Funds raised through ticket sales and a memorable silent and live auction held during the event will also continue to benefit concussion research, which remains a focus of Smashfest each year. “It’s a silver lining to a dark cloud that there’s been a number of high-profile players that have experienced concussions, which in turn has raised awareness of the injury. It’s allowed people to talk about is which is important because it’s not just an injury that affects hockey players. Concussions travel throughout our society – this is for everyone. What Dominic is doing here and what this event has evolved into really incredible,” said Eric Lindros, former star NHL player whose history with concussions posed him many problems throughout his career. Tennis all-star Milos Raonic, ranked no. 8th in the world, surprised guests in attendance at the beginning of the event and, after an exhibition game against Dominic Moore, spent the evening displaying how an immense tennis talent translates into table tennis success. The Mayor of Toronto, John Tory also made an appearance at the event as a surprise guest. In the ping-pong action, Dallas Stars forward Patrick Eaves showed his impressive skills by defeating defending champion Stephane Veilleux in the final of the players' singles tournament, while team Alex Burrows/Michael Hutchinson won the pro-am tournament. 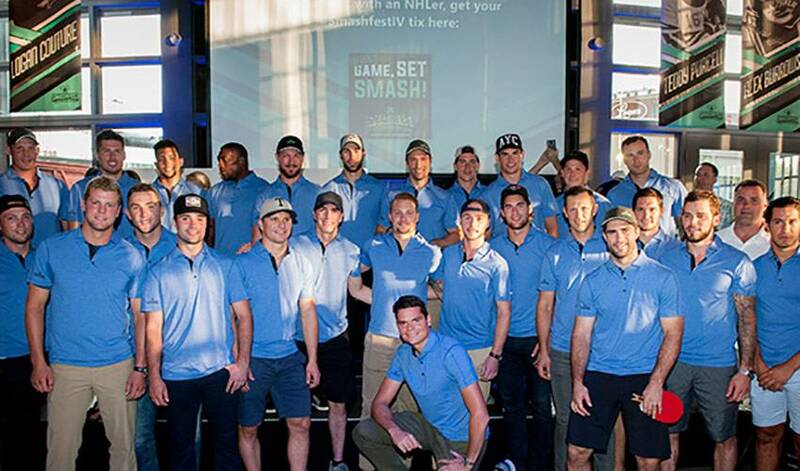 Big thanks to @NHLPA @_Smashfest @mooredom for having me. Also big thanks to everyone who came out and supported.